by Ardith Beveridge, Tastemaker in Residence - This organizational process revolves around vases and containers, but basically, it's the same process for cleaning out and putting away many other items as well. Good Luck...you'll feel so much better after it's done. The photos at the bottom are vases, pitchers and other containers from Cindi Sutter's storage area. I sent her home with a small bundle of flowers today, and she used them to create these arrangements. Cindi had these pitchers on her counter; perfect for flowers! Today I was looking around the classroom and my office, considering the late arrival of Spring in MN, I feel compelled to clean something. Try as I did to fight the urge it was too strong, you know when everywhere you look you feel like it opens Pandora’s Box. The vases need to go back in the cabinet, the pottery vase that is tucked in there needs to go the pottery area, but the poinsettia permanent botanical must be put with the others in the storage, which is explosive. I won’t explain further as writing this makes me anxious. Whew!! My advice is just begin, start somewhere. My business and life revolve around flowers and the containers and vases they go into. So I'm starting by locating the vases, pottery, or any interesting containers that could hold fresh flowers or plants and then I'm trying to always place them in that same special spot and then keep gathering until all corners are checked. Look for fun containers you have received, the baby boy planter that is sentimental-or not, the vase you have no idea where it came from. Gather all of them. The next step is to separate them into keepsake or reusable. Wash, place the keepsake containers on a shelf that you use often, not in a box where they will be forgotten. Now you have good access to the containers that you enjoy using, the ones you don’t know how to use and those you really don’t want. Today all local markets carry great fresh flowers, but it’s still no comparison to visiting your local florist. Head to your favorite and enjoy the fragrance of the flowers and colors of the vases. Take a peek into their cooler, (refrigeration) and see all their designs; so when you order you’ll know what to ask for and what might be your favorite. TIP-Ask them if they want to recycle your containers that no longer fit your needs. Take some photos of your old containers with you, so your prepared. Wash and wrap the ones that can be used, place in a box, and drop them off. The personal relationship between you and your local florist is one of trust and confidence. When you establish a personal connection it really enables them to create the designs that work for you personally. 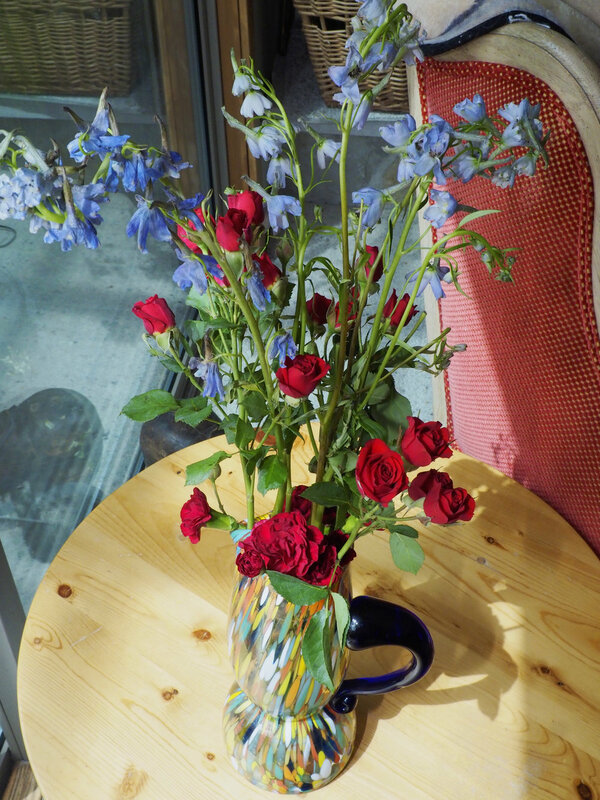 “I was the one who dropped off that red pottery vase from my aunt.” And your spouse will love it, as they can more easily buy you the flowers you really like. Everyone wins, this part of your spring cleaning is done and schedule it for same time next year. Then go have a nice cup of tea or a glass of wine and congratulate yourself for initiating the “Spring Cleaning” process.